We have to admit that we have been bewitched by double knitting. Everyone knows that you can easily get hooked into knitting and this is so much fun that it is difficult to stop. Materials: DK yarn weight, we recommend Schachenmayr Merino Extrafine 120 which you can buy here. You’ll need 2 colours. CO with alternating colors, 1 white, 1 blue. 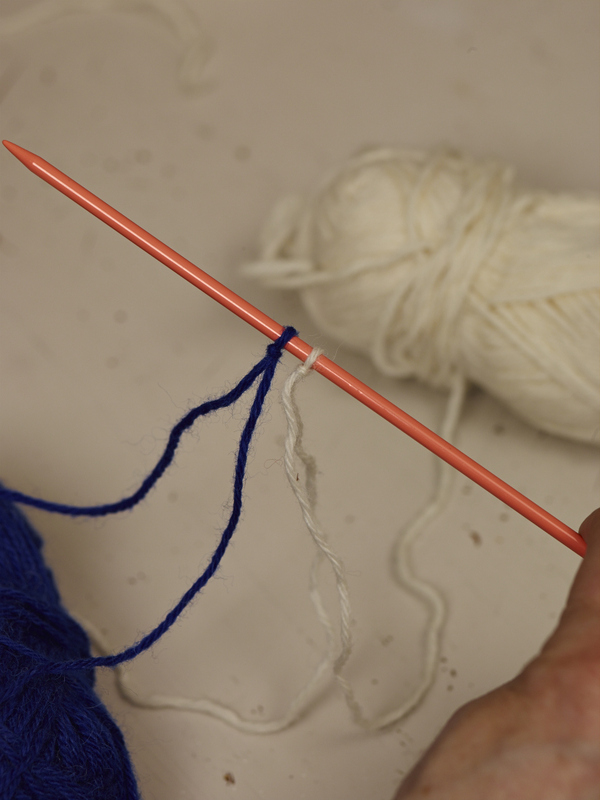 As you cast on, hold the two strands of each color on the same side of the needle throughout. 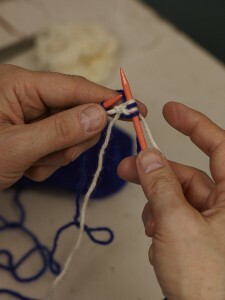 In this case, the blue yarn is held at the front of the needle while you make each white stitch and vice versa. 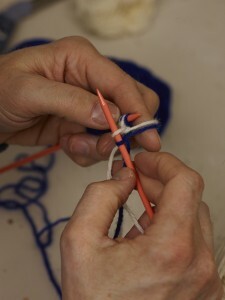 Begin with a slip knot each of blue and white (photo 2). Make sure there is enough of the loose hanging strand of each color for the number of stitches you need. CO 1 with white, using long-tail cast-on, and leave strands behind needle. CO 1 with blue and leave strands in front of needle. When you turn the work to knit the first row (photo 5), the white strand will be facing you at the front of the work while the blue yarn will be at the back. This means that the blue yarn will be purled and the white yarn knitted. 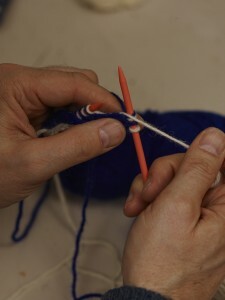 On the first row, slip the 1st two sts while you hold the strands you are knitting with between the 2 sts . Place the blue strand (purl) on your finger and *bring the white towards you, between the sts, to the front of the work and purl the 1st blue st; take the white yarn to back of work and knit the 1st white st*. Repeat from * to * across. 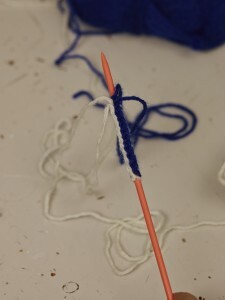 When you come to the end of the row, twist the strands and work back the same way, noting that now the white sts are purled and blue sts knitted. When you work patterns in double knitting, always think in pairs. 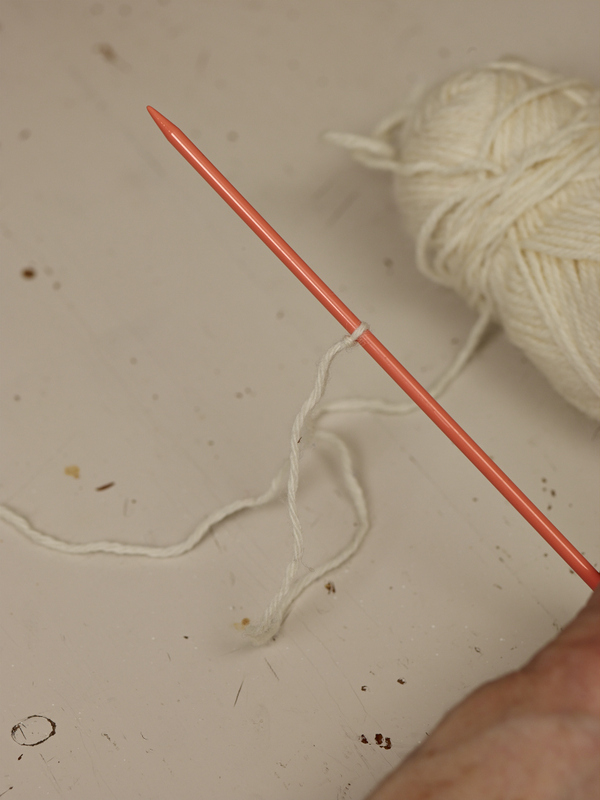 The knit st is always the opposite color of the purl st. If you want to knit a blue st next to a white knit st and the white sts are on the facing RS and the blue sts on facing WS, change the positions of the colors. Here’s how to double knit a pattern: Place the white yarn on your finger, *bring the blue towards you, between the sts, to front of work, and purl the 1st blue st with white; take blue strand to back of work and knit the 1st white st with blue yarn*. 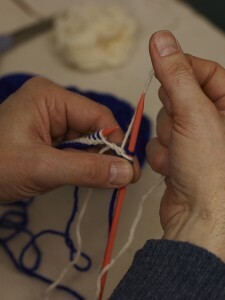 If you cast on without crossing the colors, you will soon notice whether the lower edge was worked with blue or white. 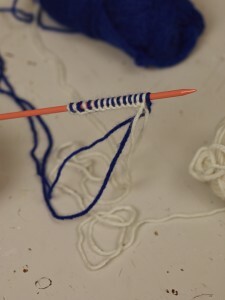 Continue working in pattern, following the chart, and don’t forget that the knit st is always the opposite color of the purl st so that the pattern on one side is the reverse image of the other side. 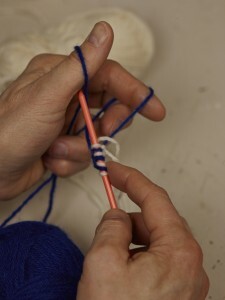 In other descriptions of double knitting, the first two sts are always knitted together with the 2 colors held together. This makes a somewhat sloppy barber pole edge. We prefer to slip both sts, leaving the edge open between the layers. It is actually rather nice to see that you have knitted double. 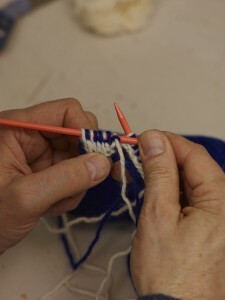 When the pattern begins, the layers will be bound together. We bind off by switching the first two sts so that they can be bound off with the same color. 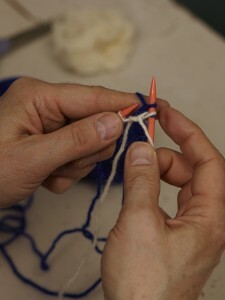 We twist the needle so that each color can be bound off with the same color thus binding off every other stitch across. 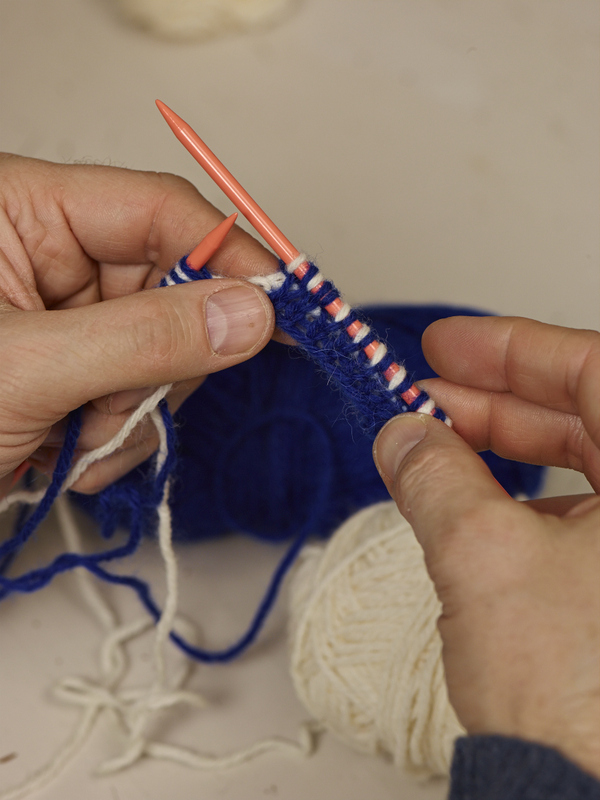 Double knitting is usually looser than regular knitting so go down a needle size or two if you notice that the piece is too loosely knitted. Yarn: Schachenmayr Merino Extra Fine 120 – DK weight ( 50gr/1.75oz 120m/131yds). 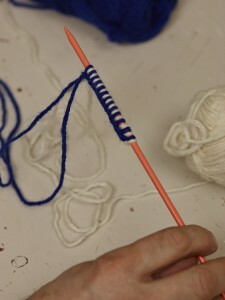 Gauge: 20 sts and 30 rows = 4 x 4 in / 10 x 10 cm. 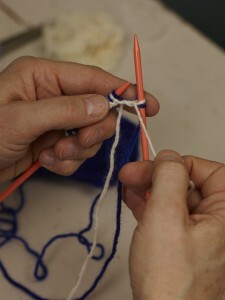 Adjust needle size to obtain correct gauge if necessary. 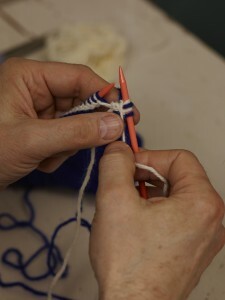 CO 35 sts with each color in double knitting cast-on (see above). 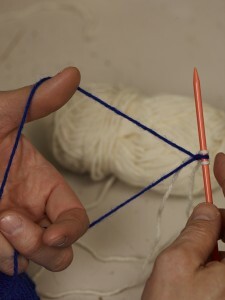 Work back and forth in double knitting following the chart. 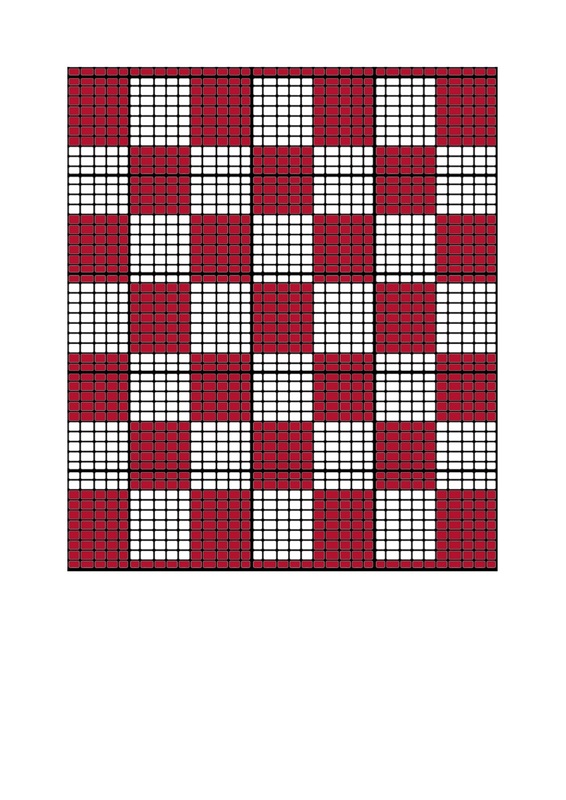 The first row of the chart = cast-on row. You should be able to see from the cast-on row which sts are knit and which are purled. 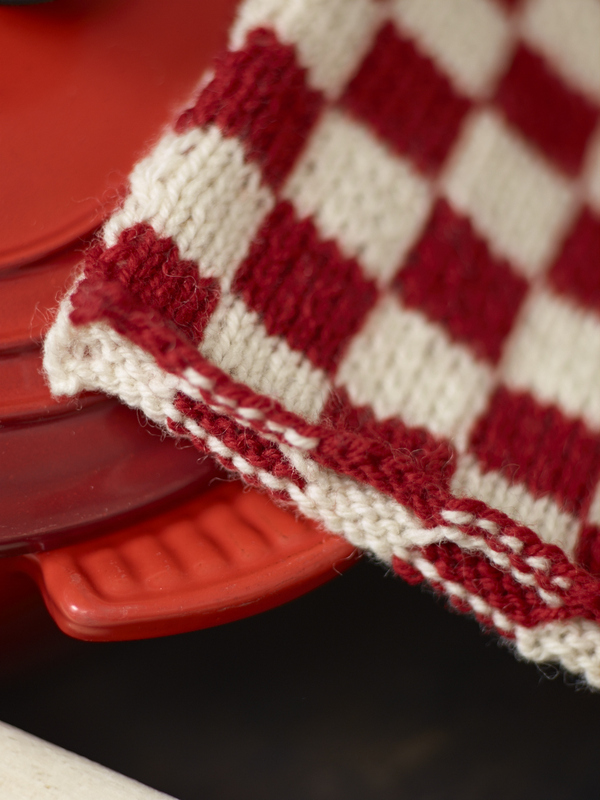 The stitch facing you closest is knit and the stitch behind is purled. Before binding off, see instructions above. 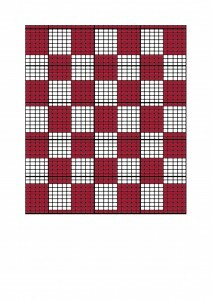 BO with red on the red side and white on the white side so the colors will match those of the cast-on row.